RJ Lannan is the reviewer for The Sounding Board. Depending on her velocity, Mother Nature’s breath has been delighting or terrifying the planet since before the dawn of man, but thankfully there is a lot of middle ground in the wind. 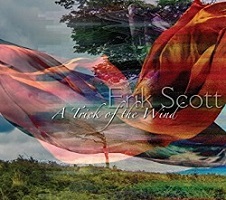 Bassist Erik Scott takes advantage of that glorious phenomenon to create his new ambient album, A Trick of the Wind. His last album In the Company of Clouds, was more organic, more New Age, but this one benefits from Scott’s legacy of finely tuned bass acrobatics and generally, more concentrated compositioning skills. The album has nine tracks that span a number of genres, including R&B, jazz, and contemporary and that’s just for starters. There are some subliminal textures throughout the recording that bear listening and analysis. Erik “Eski” Scott is a veteran of a legacy that includes major musical contributions to noteworthy bands such as Flo & Eddie and Alice Cooper and writing Grammy Award Winning songs. On “Trick” he plays fretted and fretless bass, ebow and piano. There are voices that compliment this album as well, namely, Sandy Griffith, Larry Batiste, and Bryan Dyer. John Pirruccello adds steel guitar, guitar stylist Jeff Pearce includes guitar synthesizer, Andy Mitran donates percussion, as does Celso Alberti on drum loops, and ubiquitous flugelhorn player Jeff Oster incorporates his special touch. The first track is called Wings. Voices are uplifting, melodies are lighthearted, and the mood is positively buoyant. The wind is cheerful, friendly, and warm. Scott has done something on his album that is usually rare, but that is becoming more common. As a lead on the bass, he allows all the instruments to contribute an equal share on the track. Never overwhelming, always complementing and that makes for a balanced recording. In Ghosts of Storyville Erik and company dig up some long forgotten wraiths from a time when red lights were allowed to blaze brightly in old New Orleans. Scott’s well-tooled composition takes the brave listener into the dark, dingy places, the street corners, and the hundreds of galleries that offered the forbidden fruit of the Bible belt. Cool jazz, bluesy vocals, and muted trumpet blend into an anthem of historical proportions. “Those were the days” just doesn’t cover it. You have to hear it. The title tune, A Trick of the Wind has an eerie, electronic intro that is expansive, eclectic, and delightfully chilling for the beholder. The rhythms kick in and the tune takes on a fluid progression. Maybe you heard it, maybe you didn’t, but there will be no doubt that you know something is in the air. Great cadence matched with a terrific melody. Solooca…Heart Wind is Scott’s imaginative contribution. Solooca has the word cool in it, and it is melodically, not unlike the warm, comforting breeze that the music portrays. However, it only exists in the mind and heart of the creator. Perhaps that is the fascination of this somewhat melancholic tune. Pipe organ and sitar in a contemporary tune? Why not? In the song A Wing and A Prayer Scott mixes some fantastic electronic vibes and grooving piano together and the results are mesmerizing. This one has a reflective quality that won’t let you down. This is a close your eyes and drift along kind of song. Strong bass lines open the tune The Invisible Wand. Steel guitar wanders in an out of the refrains and the soft vocal puts you at ease. There be magik here and it is hidden in the music. Is there some unseen magician controlling the cosmos? Perhaps. And you can name your conjurer, even call her/him/it God if you will. Someone’s pulling the strings and I have no doubt that they have a sense of humor. A Child Remains puts me in mind of one of the songs by Suzanne Vega called Tom’s Diner. Scott’s piece is quirky and cheerful, becoming sort of a respite from the more serious tunes on the album. What is life without humor? The cut was way too short, but it appears to bring the overall theme full circle. On A Trick of the Wind Erik Scott has once again proven that he can bring together uncommon elements and, using his skills as a compositional alchemist of the bass, create a recording that satisfies on every level. Put this remarkable ambient album on the player and relax, the wind will carry you along to places you’ve always wanted to go…and beyond. Very highly recommended.